Thank you for subscribing to The Local Steamboat Springs Pirate enewsletter, a new source for global AND local satire. We hope you'll enjoy these emails with the latest articles from The Pirate Web site, but if not, you can opt out below. Also, don't forget to like our Facebook page. DISCLAIMER: THESE STORIES ARE NOT REAL!!! In a sight that was breathtaking to see in its beauty and yet sad in its nostalgia for a "simpler" time, the last-known herd of free-range snowmobiles was briefly spotted in February charging across Steamboat Lake. It's believed the elusive wild pack was heading from Sand Mountain to Hahn's Peak to frolic in the fresh tracks there and hunt for dwindling sources of wild fossil fuels. 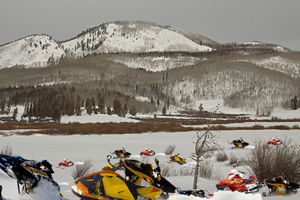 An incredibly rare photograph was taken near Steamboat Lake of the world's last remaining herd of wild snowmobiles. "It brought a tear to my eye, I can tell you that," said Josey Gales, an 85-year-old North Routt local and regular patron at Hahn's Peak Cathouse, a domesticated snowmobile outfitter and brothel in the area. "I've heard rumors of this 'lost herd,' but I never thought I'd actually see them. When they were gunning it, easily past 60 miles an hour, and so free and unencumbered of men, it reminded me of how the west used to be, when wild snowmobiles roamed all over these parts." Gales lamented the lost 'wildness' no longer found in the modern era. "Why does there have to be so much 'progress'?" added Gales, his eyes misting. "Now there's roads everywhere, and schools and healthcare facilities and such. I remember, in the good old days, there'd be nothing out here except the cold snows and a trusty 370-cc Polaris Colt 150 between your legs. And gas was free, just like our souls.